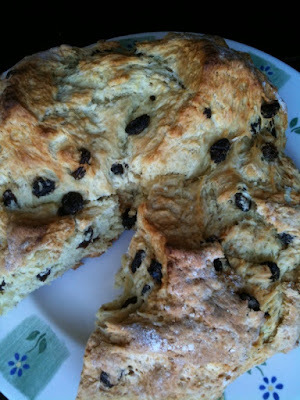 Celebrating the occasion with my favorite Irish Soda Bread recipe. Set a rack in the middle of the oven and preheat to 400 degrees. In a mixing bowl, combine the flour, sugar, baking powder, soda and salt and stir well to mix. Add the butter and rub in until the butter disappears into the dry ingredients. Stir in the raisins. Turn the dough out on a floured work surface and fold it over on itself several times, shaping it into a round loaf. Transfer the loaf onto a cookie sheet or jelly roll pan covered with parchment or foil and cut a cross in the top. Bake for 15 minutes then reduce heat to 350 and cook for about 20-25 minutes more, until well colored and a toothpick plunged into the center emerges clean. Cool the soda bread on a rack and serve with plenty of sweet butter.